Sometimes finding the perfect fabric you're looking for just doesn't happen. But instead of using something you're not crazy about, why not try making your own instead? We know that might sound complicated but it's really much easier than you think. Just like you can customize a wood surface, you can use acrylic paint to add a playful pattern of your choosing to fabric in whatever color you'd like. Thanks to the wide range of paint colors available you can take your pick for each project. Here's how to get started! The supplies needed for this craft can be as simple or specialized as you'd like them to be. While you can buy fabric paint, acrylic paint can be used on fabric and is less expensive, plus we love how many color choices it comes in too. And for the stencils, we've found that a slightly adhesive stencil works better and forms a more protective seal on the fabric. Meaning you get better results than just a regular plastic stencil. Lay your fabric out flat and before you get started you'll want to plan out what colors you want to use and where to place your pattern. If you're applying paint to a larger area you'll want to use a larger brush or sponge, if you need to paint something smaller, use a smaller version. It sounds self explanatory but using the wrong size brush can push excess paint underneath your stencil. You should also use one paint color per brush, don't mix them! Before you get started on your fabric, you're going to want to get the touch and the paint level right. So use a little test area, it can be on a heavy piece of scrap paper or a piece of cardboard. You can see if the placement is right and if your application is working too. Both are things you'll want to get the hang of before you even think about touching your fabric. You'll also want to make sure you have enough brushes on hand for each color you'll want to stencil. 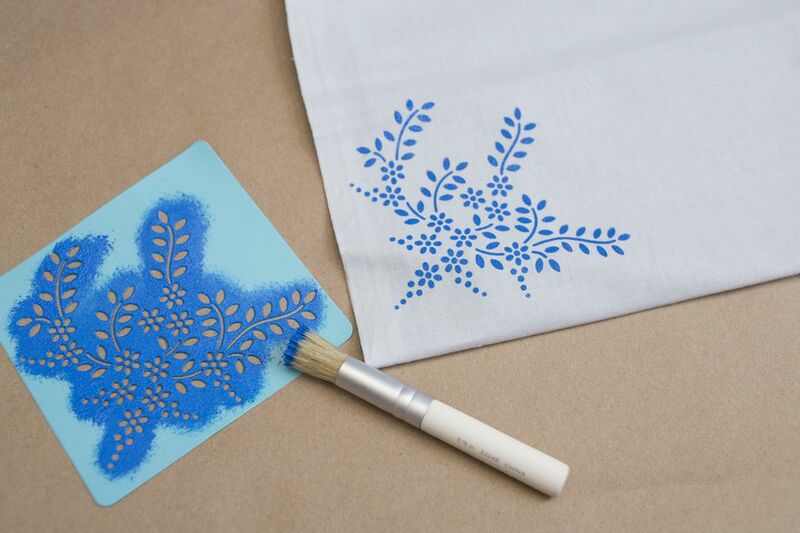 Place your stencil and using vertical dabbing motions apply the paint to your fabric, don't rush and definitely don't try to brush paint on to the fabric. You've practiced so just try to repeat the results on your test paper but on to the fabric. 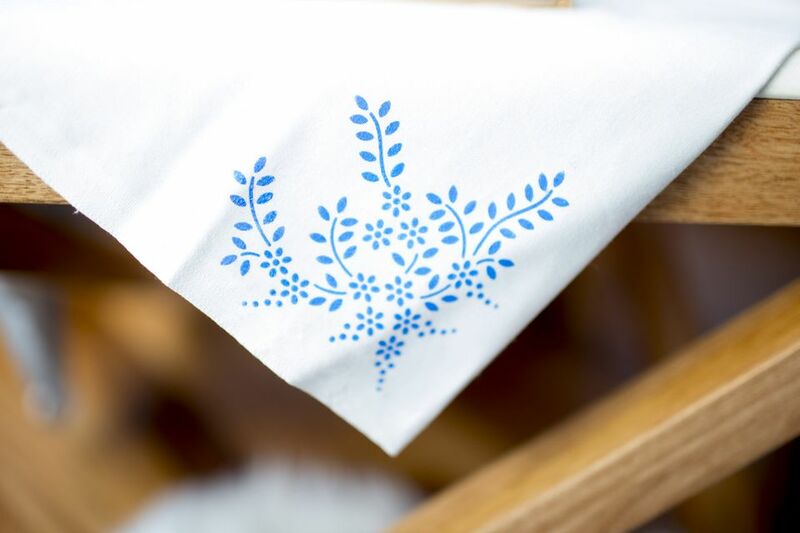 You also want to keep your stencil as clean as possible, so don't hesitate to wipe it down with a wet cloth or paper towel between colors or if a lot of paint builds up. Once you get into a good rhythm you'll be surprised by how quickly this process goes. After you're sure you've completely covered your pattern, peel back your stencil. If you want to use multiple colors that layer over one another it's smart to wait until the first layer is dry before you go to the second layer and so on. Watch out! This will quickly become one of your favorite crafting techniques.